Re: Testimony OPPOSING the Segerstrom application to change their existing CUP. Please deny this application and require that it be considered a major change to the CUP. This CUP was one of the very first frac sand mining CUPs granted in the County, and serves as a great example of a bad one. Over the last several years, the County has established a much better framework to document, evaluate and approve sand mines – largely in reaction to lessons learned from these very early CUPs, which did not do an adequate job of protecting the interests of Buffalo County. While it is unrealistic to think that this mine can be shut down at this stage in its development, it is important to reign in this reckless operator and subject the mine to the requirements that we have imposed on later applicants. Treating this application as a “minor change” without acknowledging the substantial issues associated with it is a disservice to the citizens of Buffalo County. 1. This application asks for a material change to the size of the mining operation. The original reclamation plan states that the total area to be mined is projected to be 450 acres. This plan reduces that by more than half, to 159 acres while at the same time requesting a wet plant. The goal of this application appears to be to change the primary business of this operation from being a mine to being a processing plant. 2. Current CUP does not limit the number of outbound loads shipped, does not specify destinations and does not specify haul routes. How can the Board of Adjustments evaluate the health and safety impacts of this mine due to outbound truck traffic with the information it has in front of it? This has been seen repeatedly as a crucial public policy issue in other applications, yet this application (and CUP) is mute on that topic. 3. Current CUP does not limit the number of inbound loads shipped, does not specify sources of those shipments and again does not specify haul routes. 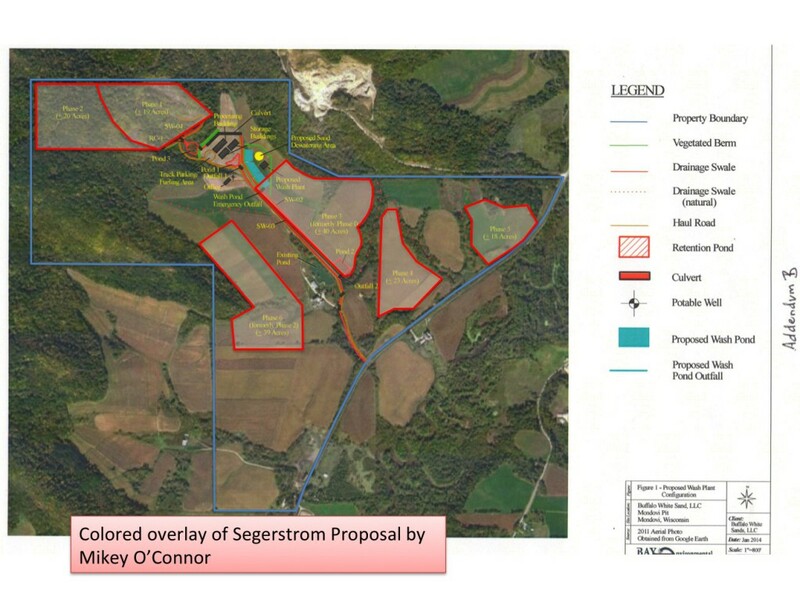 Since it appears that this application is paving the way for Segerstrom to become a regional wet-processing plant for regional mines –long after the (now reduced) mine has been wrapped up. This represents a huge loophole, which could cause endless trouble for Buffalo County citizens for decades and which ought to be rigorously documented and reviewed before the revised CUP is granted. 4. The current CUP specifies a 5-foot separation from groundwater, yet the proposal shifts the mine boundary to within 100 feet of the Buffalo River. How can a mine be moved that close to a river and still operate within that groundwater-separation standard? Where is the documentation upon which to make that determination? 5. 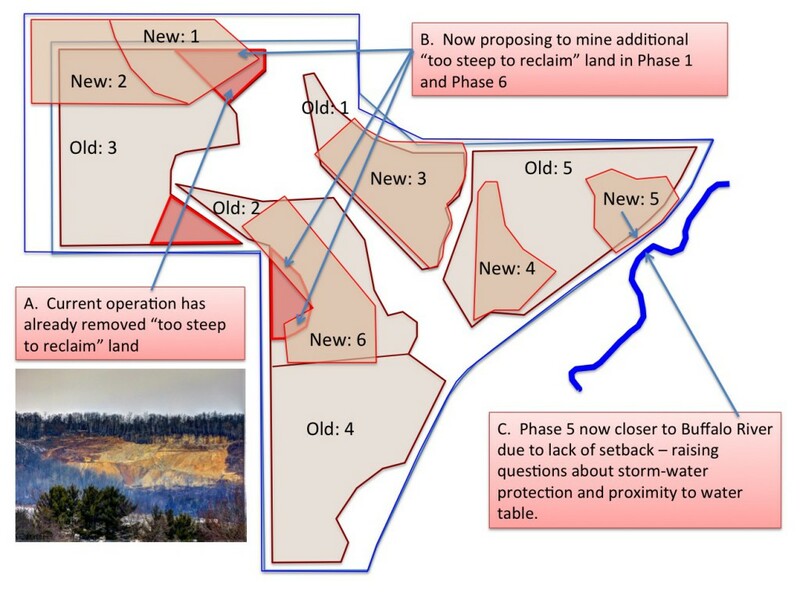 The original Reclamation Plan describes several locations on the mine site that are “too steep to reclaim” and implies that those areas will not be mined – yet the Segerstrom operation has already destroyed one of those steep hillsides and now proposes to expand mining in these “too steep to reclaim” steep-soils areas. Here is yet another reason why this application ought to be subjected to the rigor of the current application and review process. Where is the analysis of the impact on the scenic beauty of the region, not to mention the environmental impact and habitat loss that will result? 6. There are substantial property-line discrepancies between the original Reclamation Plan description of the mine, and the current proposal. 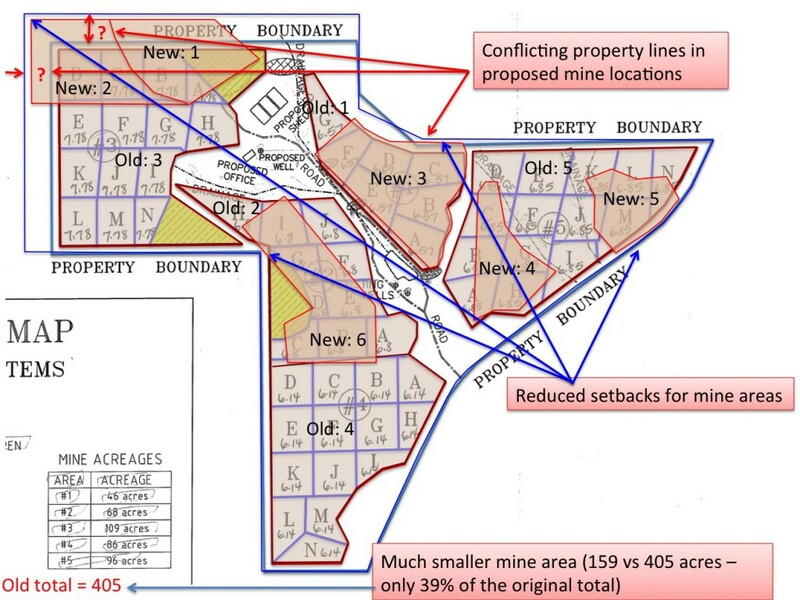 See the attached diagrams for several examples of where A) there are sizeable differences between the boundaries of the property and B) mining is proposed in what are likely to be disputed lands. There is no indication that a qualified surveyor reviewed the diagrams or maps associated with any of the Segerstrom CUP applications. Shouldn’t the County require that before granting this application? 7. The current CUP does not specify a setback for mine boundaries. While the original reclamation plan describes what appears to be either a 50 or 100-foot setback, the CUP is mute. 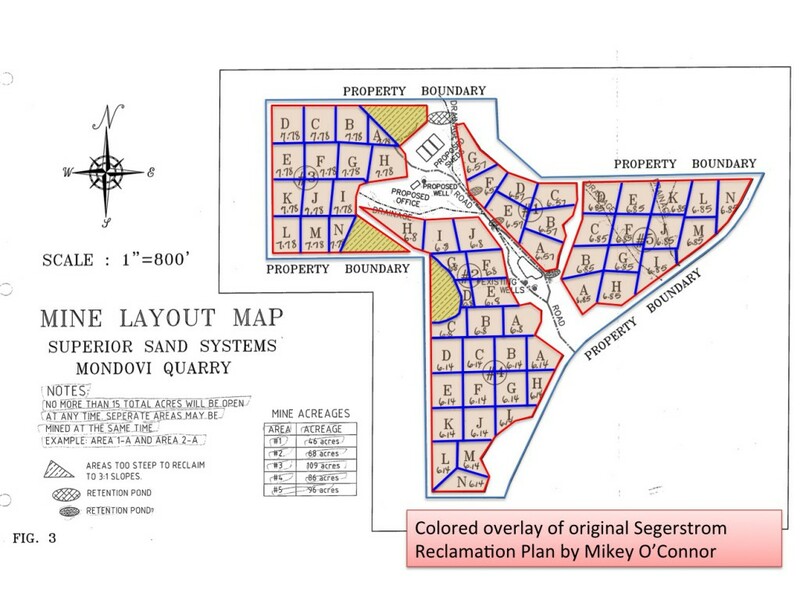 The proposed mine diagram encroaches on that original setback in key locations. In some cases, the encroachments put the mine boundary very close to the Buffalo River (and Highway 37). In other cases, the reduced setbacks increase the risk of encroaching on neighboring lands. This is primarily an appeal for due diligence and proper process. Please deny this application and let that happen. This is the mine layout contained in the Reclaimation Plan. I’ve overlaid colored boundaries in order to create layers that compare the original Rec. Plan with the new proposal. This is an overlay based on the proposal that is before the BOA. Again, just colored boundaries overlaid on top of a map provided by Segerstrom. This map puts the two maps I drew on top of each other. It emphasizes the boundary issues that are raised by discrepancies between the original Rec. Plan and the new proposal. Note that the property boundaries in the two proposals align well along Highway 37 and the southwestern boundaries. These are easy to determine from satellite imagery. However, discrepancies appear in the wooded areas to the north and west. This map also overlays the two maps. This version emphasizes the environmental issues that are raised by differences between the original Rec. Plan and the new proposal. 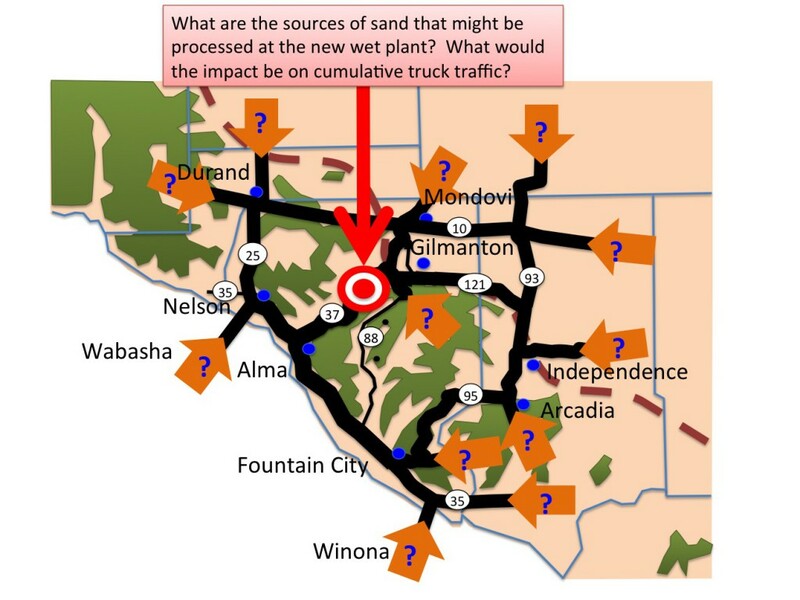 This map highlights the fact that there are no CUP conditions on this mine with regard to processing sand from sources other than the mine itself. Given that the mine is getting much smaller, one has to wonder whether the real reason for this “minor change” is to develop a regional processing plant to service and enable other mines. This map describes the problem with the lack of CUP conditions describing outbound haul routes and destinations. There are no conditions on how many loads/day of processed sand, or the destination of those loads. There are indications in meeting-notes that 100 loads/day is the target, but there are no CUP conditions to enforce this limit. I disagree. This is a major change to their operation — because it puts them in a position to be a regional processor of frac sand long after the local mine is done. This is especially important because the Segerstrom permit is one of the very first ones approved by the County back in the days when nobody was paying attention. So unlike today where we have the benefit of a much more rigorous zoning ordinance and a much more detailed set of requirements to file an application for a sand mine or a processing plant, there are virtually no limits on what Segerstrom can do. Here are a few maps to give you a sense of the trouble we will be in if this application is approved. The bulls-eye shows approximately where the Segerstrom mine is, on Highway 37. The incoming arrows show all the places where sand could be coming from in order to be washed at Segerstrom’s. The current permit places no limit on the number of trucks, the locations they could be coming from. the routes that they are required to follow or the hours of the day that they are prohibited from running. If you live along any of these routes, you are at risk of an unpleasant surprise that could come along any time over the next 20 years or so. Imagine what that uncertainty is going to do to your property value. The Segerstrom permit also makes no mention of where sand will be shipped, the number of trucks, the route that it will take or the hours of operation. So here’s a map of all the options. 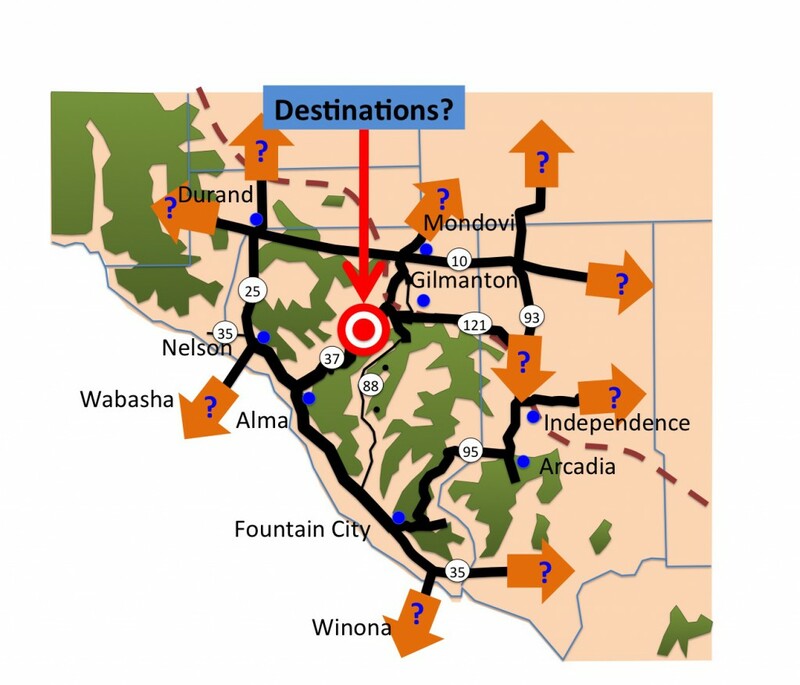 Again, if you live on any of these roads, your life could change over night if the Segerstrom operation finds a better deal on selling or loading their sand over the life of that plant. Segerstrom stated on the record, at least twice, that no trees would be taken down. He also said that no more than 10 acres would be open at a time. Here’s a picture of the site I shot a little over a year ago. Draw your own conclusions. You can see a few more versions of this picture in the original blog post — click HERE to see that post. The Board of Adjustments is meeting on April 23rd (3pm, at the Buffalo County Courthouse) to consider this modification to the Segerstrom permit. Click HERE to go look at the details of the meeting on our “Meetings” page. I’ll be there — I’ll be asking them to consider this a major change to their permit, one that should go through the whole permitting process rather than just the abbreviated one that is allowed for minor changes (which is currently what is on the table). Please join me — this is a change that has county-wide impacts. 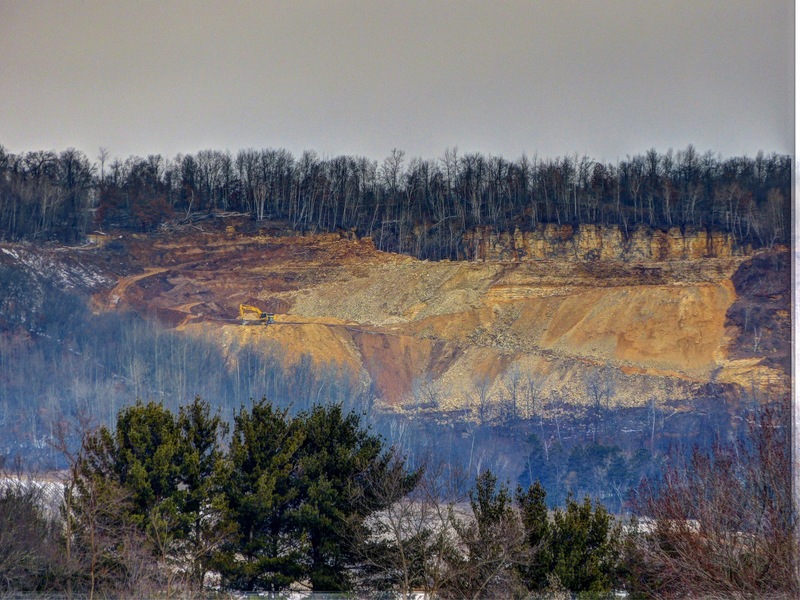 The Badger Bluff Sands application for a sand mine spanning Schoepps Valley Road and Oak Valley Road was soundly defeated this week after comprehensive and well-researched testimony against it, for all sorts of reasons. What became clear during the testimony is that Kevin Rich, the mine promoter, hasn’t made much of an effort to win his neighbors over. Although Kevin spent the day addressing us all by our first names as we asked questions during a site visit, dozens of his neighbors painted a dramatically different picture during testimony that evening. Chuck Baker, owner of Chuck’s Repair Shop was represented among the group of neighbors testifying against the mine. 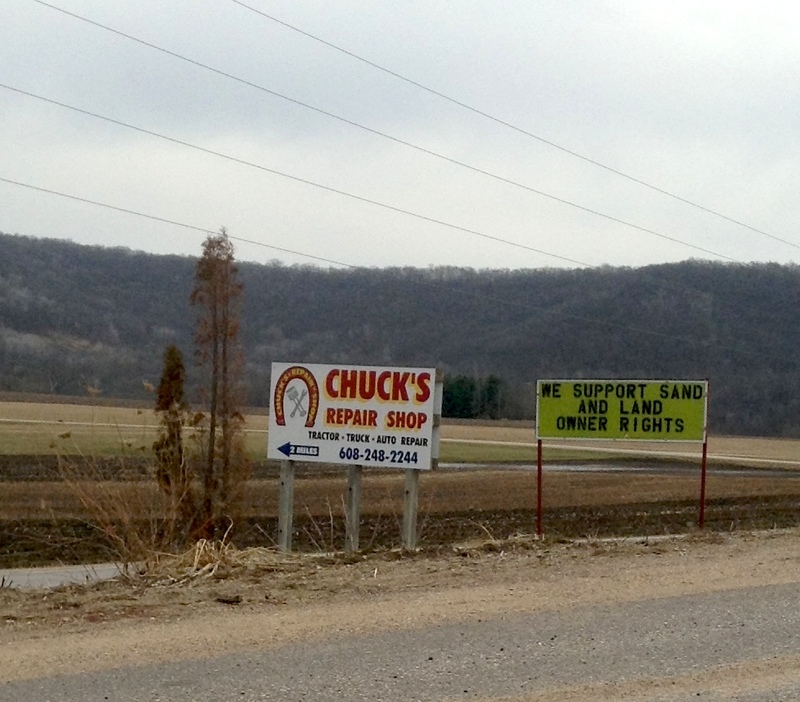 A couple of days earlier, this sign appeared next to Chuck’s sign out on the highway. It gives a great impression of what a good neighbor Badger Bluff Sands has been, no? Thanks Chuck (and all you others). If I have any auto repairs coming up, Chuck’s going to get my business. I hope he gets yours as well. I hope you think about the careers of Buffalo County children and deny a rezone application that will put a 19th-century style rail-loading facility in the heart of Buffalo County, focus our economy on mining, and wreck one of the best chances for Buffalo County to compete and win in the 21st century. Internet Infrastructure: All of Buffalo County has reasonably fast DSL. That portion of the County served by the Nelson and Cochrane telephone cooperatives has “fiber-to-the-home” – which is the best “future proof” Internet infrastructure in the world. Unspoiled environment: Buffalo County is in the Driftless Area – some of the most beautiful and unique natural habitat in the world. Air travel: Buffalo County is within 2 hours of an international hub airport offering convenient, reliable and diverse travel options, worldwide. There are more of these attractions (hunting, fishing, boating, etc. ), but you get the point. We could focus on developing 21st Century jobs (which, like mine, can be done anywhere there’s good Internet access). We could teach our kids how to compete at a world-class level without leaving their houses, never mind leaving the county. What do 21st century Information Economy workers want when they’re choosing a place to live and work? They want a vibrant community, beautiful places and great access to the world. We have all these and more, right now. Many county economic development officers would kill to have the “future proofing” amenities that we can offer here in Buffalo County. Let’s focus on delivering a positive future, and opportunities for the next generation. Please vote for 21st century jobs, not 19th century ones. Oppose the Starkey rezone. I am a business owner and resident of Buffalo County, currently under siege by an out-of-state sand-mining company attempting to launch a multi-location frac sand strip mining and rail loading facility here. I’m also a member of an informal group of people striving to bring order and fair play to the process of siting mines and rail facilities here in the County. Many of us are farmers and small business owners. We see the businesses we have worked hard to build threatened by a pell-mell rush to introduce 19th century mining jobs into this region. Buffalo County is well positioned to expand its economic base by competing on the world stage for 21st century Information Economy jobs – but that opportunity will vanish if the region is hurled back into a 19th century extractive economy. We are united in the idea that decisions that have such profound impacts on local businesses and residents should be made locally. The consequences of your actions will put some of us out of business. And, by destroying the amenities which make this area attractive first-tier information workers, our residents and children will be at a permanent disadvantage in the worldwide Information Economy. Please vote against these bills.